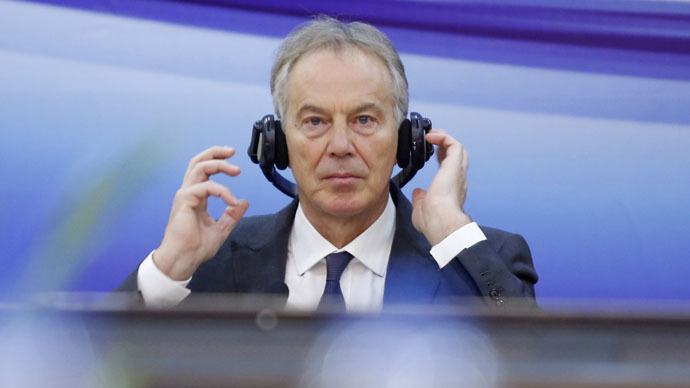 Tony Blair waded into the Labour Party election campaign on Tuesday, warning voters that a Conservative victory in May, leading to a referendum on Britain’s EU membership, would plunge the nation into a period of instability not seen since World War II. Speaking at an event in his former constituency, the three-time prime minister said PM David Cameron had been forced into discussing the possibility of a referendum due to the surge in UKIP support. “This issue, touching as it does the country’s future, is too important to be traded like this,” Blair said. He said people who were in favor of a “Brexit” were motivated by fear and scapegoating. He urged voters to consider the positive impact the EU has on global security. “Do we really think this is the time in which to put into play our very membership of the European Union, the largest commercial market and most developed political union in the world? And the one on our doorstep?” he said. Blair warned of economic and social “chaos,” which he said would reign should Britain leave the EU. His speech focused on the social implications of a potential exit. He also said Britain would be viewed less favorably and the decision would have damning repercussions. “A decision to exit Europe would say a lot about us, and none of it good: that an adventurous country has become a timid one; that one with global ambitions has opted to be a parochial bystander. Blair’s support for Miliband has been widely questioned during the campaign, with the Conservative Party quick to note that he had once said the Labour leader was unfit to run the country.